THE "HIGHWAY HELPER" IS DESIGNED FOR THE LONG DISTANCE TRUCK DRIVER AS WELL AS THE LOCAL DRIVER WHO DRIVE TACTORS AND TRAILERS. 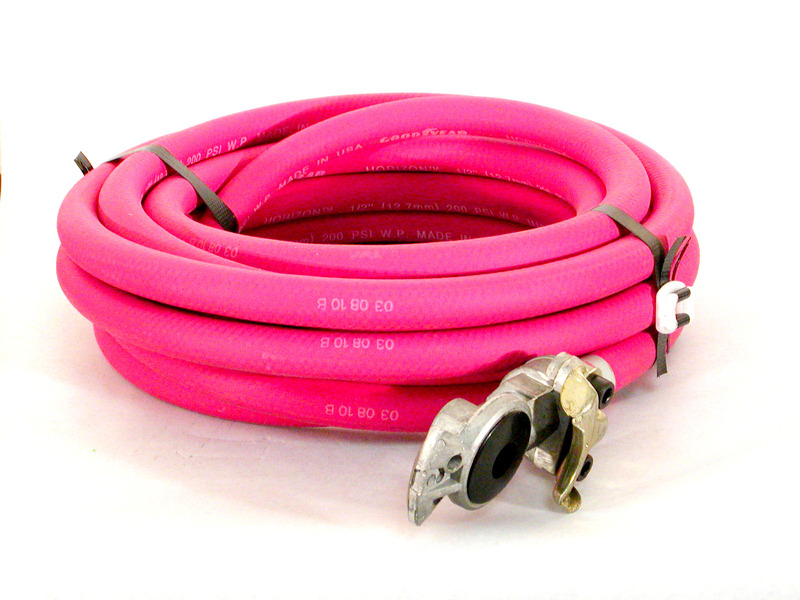 THE "HIGHWAY HELPER" CONSISTS OF 25 OR 50 FEET OF 1/2" RUBBER 200 PSI AIR HOSE WITH BRASS FITTINGS STEEL BANDED ON. ONE END IS A "GLAD HAND" THE OTHER END 1/4" AIR BALL CHUCK . THE "HIGHWAY HELPER" IS CONNECTED TO THE TRACTORS AIR SUPPLY LINE FOR INSTANT AIR SUPPLY TO FILL TRUCK TIRES. BY REMOVING THE AIR BALL CHUCK, SMALL AIR TOOLS MAY ALSO BE USED. DRILLS, AIR RATCHETS AND AIR BLOW GUNS MAY BE ATTACHED TO REMOVE DUST AND DIRT IN HARD TO REACH PLACES.